Add Your Name: Support a Green New Deal! A Green New Deal would put people to work in good union jobs, while enabling communities to invest in projects like removing lead from drinking water, retrofitting buildings to make them more efficient, and expanding our clean energy grid. These investments can play a critical role in fighting climate change and reducing racial and economic inequity by prioritizing benefits for working class families, communities of color, immigrants, and others who’ve borne the brunt of the fossil fuel economy. Many states and cities already have a head start in adopting Green New Deal policies, creating momentum for national action! Take Illinois, for example. One month after Trump was elected, the Illinois Clean Jobs Coalition -- including Sierra Club's Illinois chapter and environmental justice, labor, and consumer allies -- succeeded in enacting the Future Energy Jobs Act. 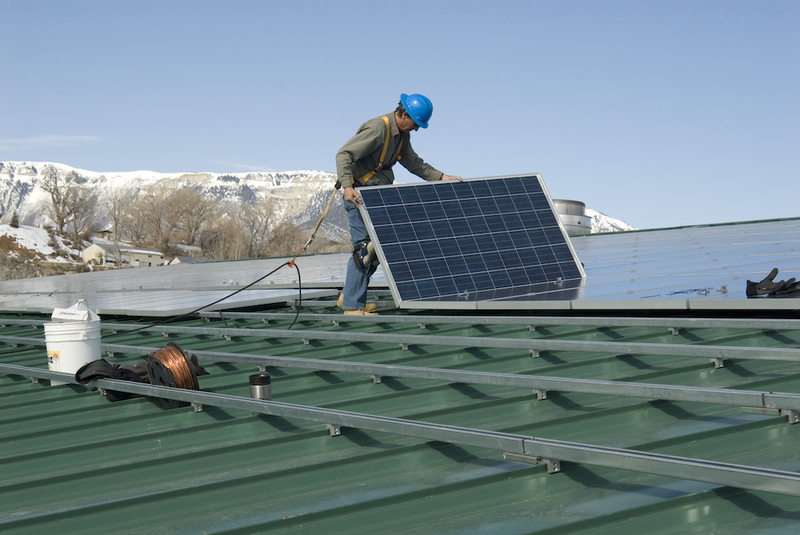 The law includes a Solar for All program to massively expand installation of solar panels in the state, prioritizing solar access and job training for low-income families and formerly incarcerated people. The law also is creating thousands of union jobs, slashing energy bills, and cutting climate pollution by boosting energy efficiency standards. From California to Minnesota to New York, similar efforts are underway -- a growing movement that unites workers and environmentalists, despite Trump’s attempts to divide us. Nationwide, a broad majority of the public -- across geographic and racial lines -- supports Green New Deal policies like a federal guarantee of high-wage jobs in projects that accelerate the transition to a clean energy economy. Add Your Name: Support a Green New Deal to create good union jobs and jumpstart the transition to clean energy! It's time for a Green New Deal! We need a Green New Deal to speed the transition to clean energy, clean air, and clean water while investing in workers and communities. It’s time to put an end to status quo economic policies that pad the pockets of CEOs while exposing communities of color, immigrants, and working class families to toxic pollutants, climate disasters, low wages, and unsafe working conditions. It’s time to invest instead in projects that create good union jobs, support healthy communities, reduce racial and economic inequity, and tackle climate change. We support an equity-driven Green New Deal to put people to work and jumpstart the transition to clean energy!